6 1/8 x 9 3/8 in. Howard Greenberg Gallery in association with Commerce Graphics is pleased to announce an exhibition of photographs by the critically acclaimed photographer Berenice Abbott. This exhibition will not only focus on her well known photography but will also display examples of her earliest work as a portrait photographer in Paris during the 1920’s; her New York photographs of the 1930’s; her scientific photographs from the 1950’s and her images from U.S.1 the coastal highway from Maine to Florida. 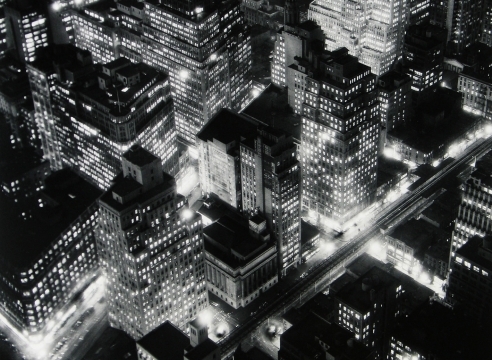 In 1923, Berenice Abbott began her photographic career in Paris, assisting Man Ray. Two years later she had her own thriving portrait studio. In 1928 she participated with André Kertész, Germaine Krull, Man Ray and others in the First Independent Salon of Photography. Her sitters comprise a virtual catalogue of the artistic and intellectual life of the time.